Whilst 2018 ended well for Lee Freedman, earning the Australian his first Singapore title, the new season has started off on a quiet note for the champion trainer. After six fruitless meetings, Freedman was finally off the mark when HELIOSPHERE led all the way in the Kranji Stakes C event over 1600m at Kranji here tonight. HELIOSPHERE had won his Singapore debut last month and two Fridays ago, came home third in a similar race to BLACK JADE over 1400m. But Australian entire raised his game tonight to beat BLACK JADE by 1 1/2 lengths. "I think I’ll probably give him one more run over the 1800m. If he can get his ratings up, then we will give him a break, and prepare for the Derby in July," said Freedman. "He’s a promising horse, but I’m not certain I did the right thing not gelding him before this prep, but that’s something we can think about." HELIOSPHERE, who cost A$160,000 as a yearling, finished on board in all his three runs at two, winning once over 1600m at Warwick Farm. 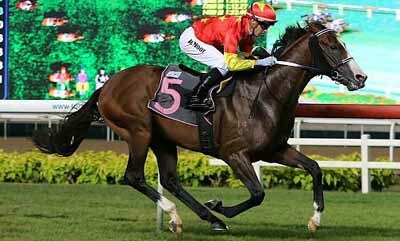 He was placed in both his two runs at three before coming to Singapore.